The Arts and Crafts Gallery. A few illustrated examples of Arts and Crafts wares. An arts and crafts gallery to provide a brief look at the exceptional quality and superb design available to the arts and crafts collector. 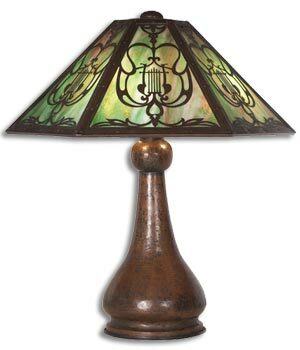 The arts and crafts designers rejected the banality and inferior quality of industrially produced decorative arts by promoting a return to a handcrafted medieval style craftsmanship. This can be seen in works by artists such as William Morris, William de Morgan, Gustav Stickley, Charles Ashbee and Charles Voysey. Typical motifs come from traditional techniques with slat back chairs, leather upholstery, turned feet, rush seating, enamelling, thick ceramic glazes and hand hammered metalwork. 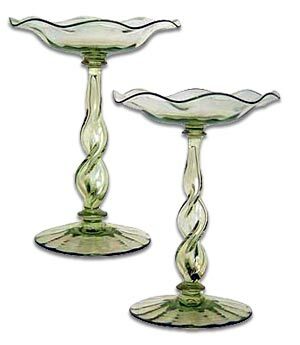 A pair of Arts & Crafts comports in sea green glass with hollow air twist stems. 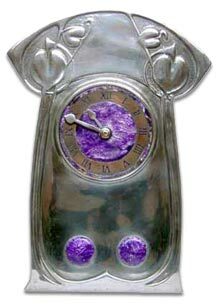 An arts & crafts Tudric pewter clock with unusual purple enamel designed by Archibald Knox for Liberty & Co, England c1902. 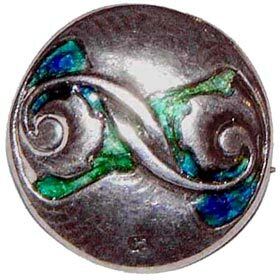 Arts & Crafts Cymric silver and enamel brooch designed by Archibald Knox for Liberty & Co and made by Haseler. England circa 1902. 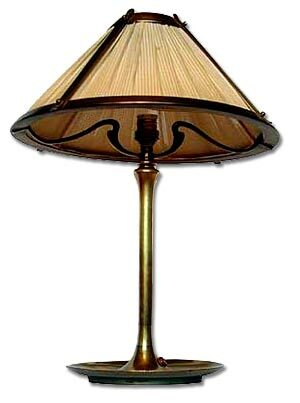 A fine Arts & Crafts brass table lamp with original fabric shade, in the style of Jan Eisenloffel, Netherlands circa 1905. 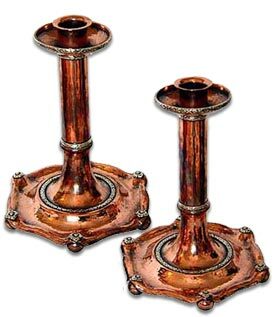 A fine pair Arts & Crafts hand beaten copper candlesticks with silver applications By A.E. Jones, England circa 1900. 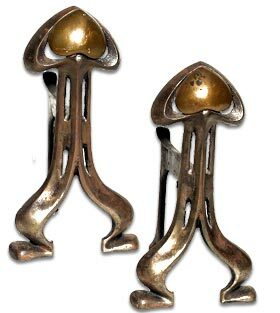 Arts and Crafts reticulated iron and copper spade design andirons or fire dogs. With copper applied spade design at top. Hexagonal slag glass shade with metal overlay over a hammered copper base. Fine patina, unsigned.